Whether they were brothers or not is left to further research, but, what we do know is that, from approximately 30 men who documented the fact that they were born in Page County, Virginia (meaning, there may have been more who were born in Page, but did not document the fact on their enlistment papers), and served in the USCT , two men by the name of Appleberry/Applebury served in two different USCT organizations. Both appear to have been freed (or, perhaps, self-manumitted/”ran away”) from slavery on or before April 19, 1861 (two days following the Virginia Convention’s decision to secede), and both moved into Pennsylvania following freedom. Albert Appleberry first appears in military-related records as an unmarried resident of Hopewell, in Cumberland County, Pennsylvania, when he enrolled for the draft in July, 1863. Called-up by the draft within a month, he was enlisted for three years in Co. I, 8th United States Colored Infantry, on August 4, 1863, in Carlisle, Pennsylvania. Listed as 25 years of age, 5’6”, with black complexion and hair, Albert listed himself, by occupation, as a laborer. 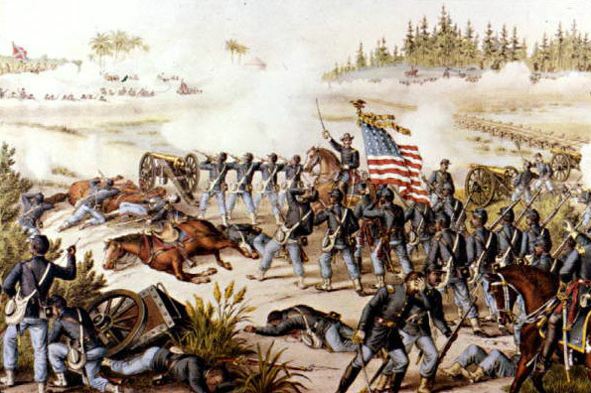 Albert’s military service documents a good deal of action, at the Battle of Olustee, Florida, on February 20, 1864; Chaffin Farm, Virginia, September 29, 1864; and Chaffin Farm (Darbytown Road), again, on October 13, 1864 (when he was wounded in the right thigh by a shell). Though recovering from his wound in the hospital until March 17, 1865, his record states that he was again in action “before Petersburg” April 2, 1865; and at Appomattox Court House, Virginia, April 9, 1865. Records also show his listed as a deserter, in June 1864, but that charge being dropped without trial or loss of pay, under Special Order No. 165, dated August 2, 1864, and signed by Gen. William Birney, as commanding officer. Albert Appleberry was honorably discharged at Brownsville, Texas on November 10, 1865. Like Albert, it appears that Daniel Appleberry (born ca. January 1831) was residing in south-central Pennsylvania in 1863. When he enlisted as a volunteer in Co. H, 22nd United States Colored Infantry, he did so at Chambersburg, Pennsylvania. Listed as a farmer/laborer, Daniel enrolled for three years of service. Service continues from that point without interruption, until June 28, 1864, when he was listed as having been wounded in the head. Though absent briefly, he was again on the rolls by the next muster. Absent sick on Brownsville, Texas, on July 16, 1865, he was back in the ranks when the regiment was mustered-out at Brownsville, on October 16, 1865. Neither Albert nor Daniel appear to have applied for pensions (nor their widows… if Albert actually married after being discharged), and nothing more can be found about Albert through the census records. On the other hand, Daniel appears to have returned to Pennsylvania, and married to Mary/Marin L. (born in Delaware in May 1850) in 1866. The couple had at least three children, including William (born ca. 1872), Annie (born ca. 1873), and George (born ca. 1877). Daniel was listed on the 1890 Veterans’ Schedule Census for Harrisburg, Pennsylvania, and in the 1900 census, residing in Ward 7. He was also listed in Boyd’s Directory for Harrisburg, as a laborer, residing at 318 Muench (from ca. 1875-1882). Daniel died sometime between 1900 and 1910, as Marin/Mary appears as a widow in the 1910 census record. John P. Washington, one of the patriarchs on the hill, died on Dec. 21st at the home of Homer Tyree in Egypt Bend, at the age of 82 years. Washington was one of the few old colored people of Page county who were born in this county. He was a son of Aaron and Lucindy Washington, slaves of Daniel Koontz, of Alma and was himself born a slave. In his boyhood he was bound out to Perry Broyles, of Luray, who had the benefit of his services until he was twenty-one. He lived for thirty-five years at Steelton, Pa., where he was employed in a steel plant, made good wages and was an active and enthusiastic member of colored fraternal organizations in which at that palmy period of his life he took a huge delight . He was injured there and the steel company retired him on a pension. He lived for many years in single blessedness but in the latter part of his life he married Eliza Coleman, widow of Yancey Coleman, of Luray. She died some years ago. Ten years ago Washington having returned to Luray joined the Old School Baptist Church and thereafter became the leader amongst the colored Old School Baptists at this place. He was instrumental in holding regular preaching on the hill and boosted his cause in many ways. At the same time he attended churches of other denominations, was a participant in their services and did some preaching. Washington was a man of big stature, jet black, good natured, harmless, honest, talkative, self-assertive in a crowd, one who had been around and seen much but was entirely uneducated. He leaves a daughter who married Robert Cyrus. Secret orders and public functions were his hobbies, He was feeble and failing in mental power for a long time, but was physically active till two weeks before his death, when his last illness began. He was buried in the Odd Fellows cemetery on Dec. 23rd, Eld. Allen Williams of the colored Old School Baptists conducting the services. Eld. Arthur Campbell, a white minister, talking briefly at the funeral.